This Neptune, New Jersey hotel is located half a mile from the Jersey Shore Premium Outlets and 15 minutes’ drive from the beach. Facilities include an indoor pool and free Wi-Fi access. A flat-screen TV is available in every guest room at the Hampton Inn Neptune. Decorated in bright colours and dark wood furnishings, each room has a desk and en suite bathroom. Select rooms have a microwave and refrigerator. Guests can relax in the hot tub after working out in the on-site fitness centre. Laundry facilities and a 24-hour reception are also provided at the Neptune Hampton Inn. A hot continental breakfast is served every morning in the hotel lobby. The hotel is half a mile off the Garden State Parkway. The Asbury Park Convention Hall is 6 miles away. You must show a valid photo ID and credit card upon check-in. Please note that all special requests cannot be guaranteed and are subject to availability upon check-in. Additional charges may apply. Please note, only guests above 21 years are allowed to check-in to this property. Please note, a security deposit of USD 35 is required upon arrival for incidentals. This deposit is fully refundable upon check-out and subject to a damage inspection of the accommodation. Guests are required to show a photo identification and credit card upon check-in. Please note that all Special Requests are subject to availability and additional charges may apply. 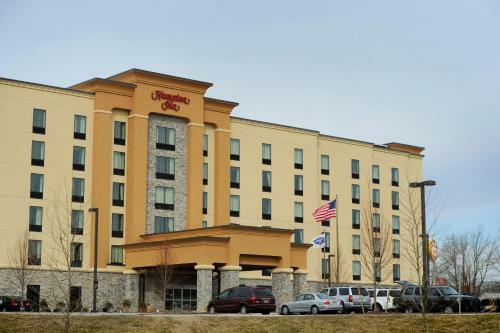 the hotel Hampton Inn Neptune so we can give you detailed rates for the rooms in the desired period.